We have been living in our current home for just over five years. 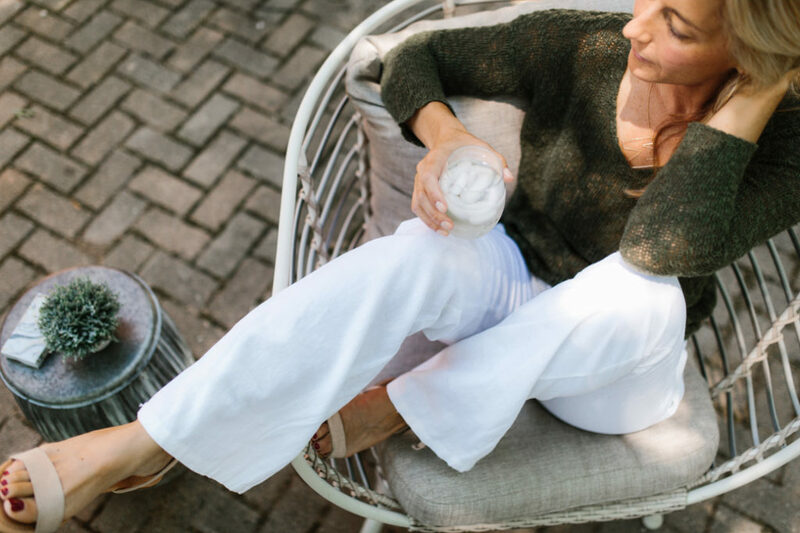 And in all those years, we never have spent time sitting outdoors on our patio. 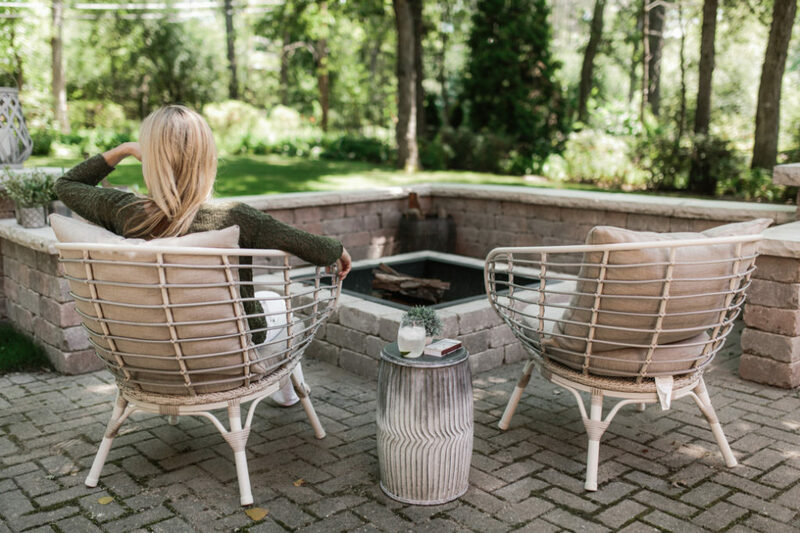 We had big plans to eventually creating an outdoor living space, so I held off investing in any sort of patio furniture for outside. Of course projects within the home took precedence during these years. After all, more time is spent indoors versus outdoors living in Chicago! So it was not until this spring, that we finally decided to take on planning for an outdoor space. Our goal was to create a space where we could spend time with family and friends in the evening. 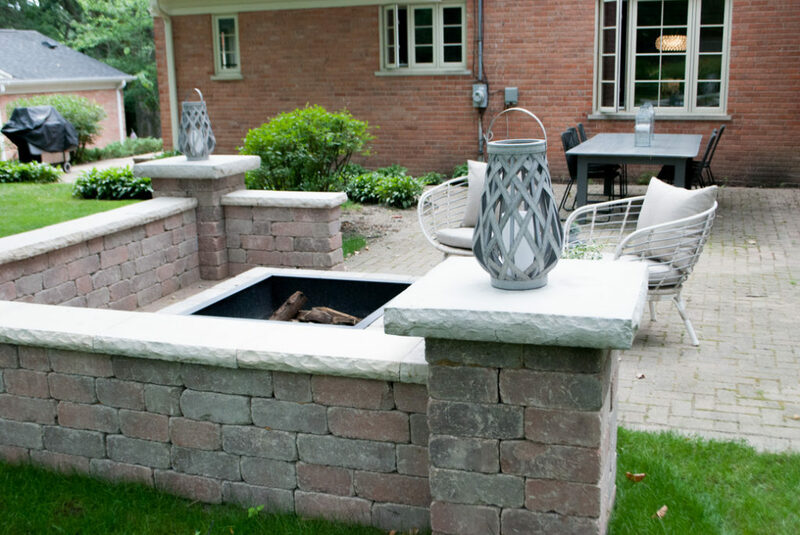 Ultimately we wanted to incorporate an outdoor kitchen, dining and sitting area onto our patio. Bidding that out though sent us into sticker shock! So we scaled back our concept. 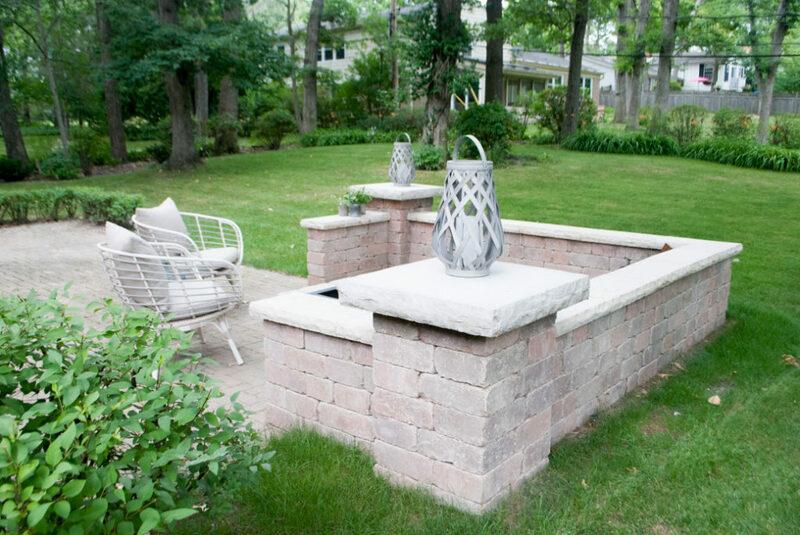 We decided that building a sitting wall area around a fire pit could fulfill our outdoor needs. Although this project was on a much smaller scale than our initial objective, we still were sent into sticker shock with the cost of hiring someone to do it. It does involve a lot of material, labor and time, and with that, comes a hefty price tag. With four very able bodies living under our roof, Rob and I resolved to take on this project ourselves! Over the years, Rob and I have spent countless hours improving our homes ourselves. Since we have been together, we have lived in five residences! Early on, we bought homes that required major improvements, and took on the improvements ourselves. Rob with the manual labor and myself with the vision planning and finishing touches. LOL! As the kids got older and our lives got busier though, our desire to take on home restorations and DIY projects dwindled. Fast forward to this, and it was exciting once again to take on a project. And this time with our kids able to help us! Creating this space required three things: planning, material and labor. Although Rob and I came up with the vision as to how we wanted the space to look, all the conceptual planning, (measurements, etc.) I differed to him. He is just one of those people that knows what to do when it comes to big projects. If he were not a pilot, he would make for an excellent architect or general contractor! 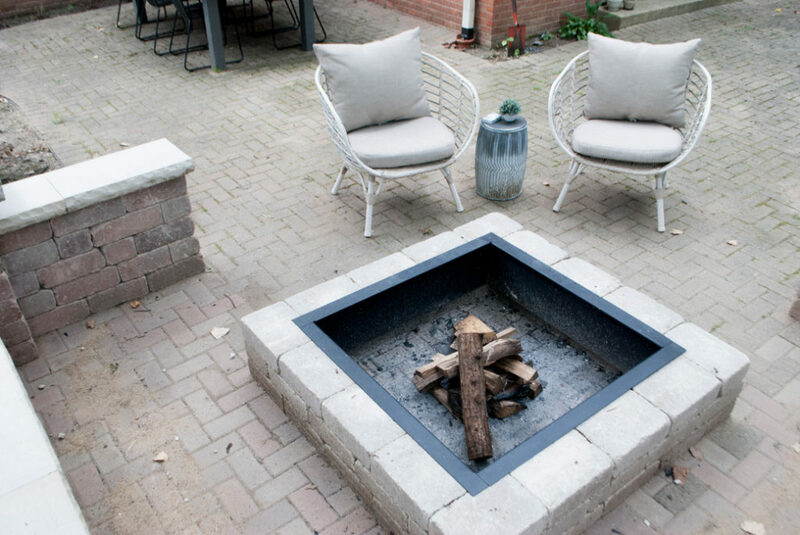 We live a few blocks away from a landscape and building supply company, Menoni and Mocogni and they had everything we needed-sand, gravel, bricks, fire pit insert etc. and a Home Depot run provided us with all our additional needs. The hard part of course was the labor. We needed to transport all the material of bricks, gravel and sand dumped on our driveway from the front to the back. That required lots of heavy lifting, shoveling and back and forth with wheelbarrows. Once there, we needed to extend out a portion of our patio which required digging and leveling with sand and gravel. Although the space was small, leveling this area was one of the more challenging aspects of this project! 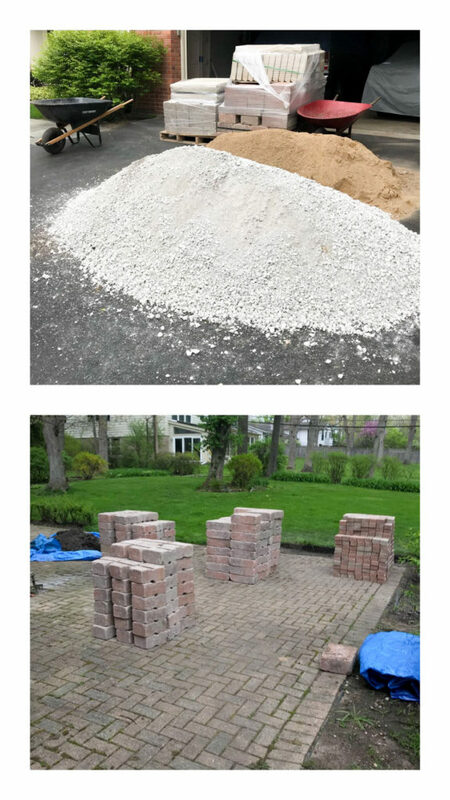 The actual laying of the brick to create the sitting wall and fire pit went fairly quickly and easily. The only time we truly ran into a problem was trying to lift 200 lb stone caps to place on top of the pillars. Luckily we had two high school football players to come help with this! All in all the labor portion of this project took on a full three days. We had a huge sense of pride and accomplishment once that last brick was laid down! Of course the fun part was adding the decorative touches to our new space. However, I was once again sticker shocked at the cost of outdoor furniture! It is one thing if we lived in a warm destination where the space is used all year. Yet for only a few months of use, I was determined to find cost friendly pieces. Two retailers that ended up having quality and stylish pieces but without the hefty price tag were World Market and Target. The seating featured on our patio I found at World Market and I am obsessed. I was able to visit a store and sit in it so I knew that once it arrived, we would be happy with it. What’s also so nice about World Market is that I rarely pay full price for things, as there is always a promotion to take advantage of! Items can sell out very quickly though! Target has really stepped up it’s furniture game over these past few years and I really gravitate towards their accent pieces. 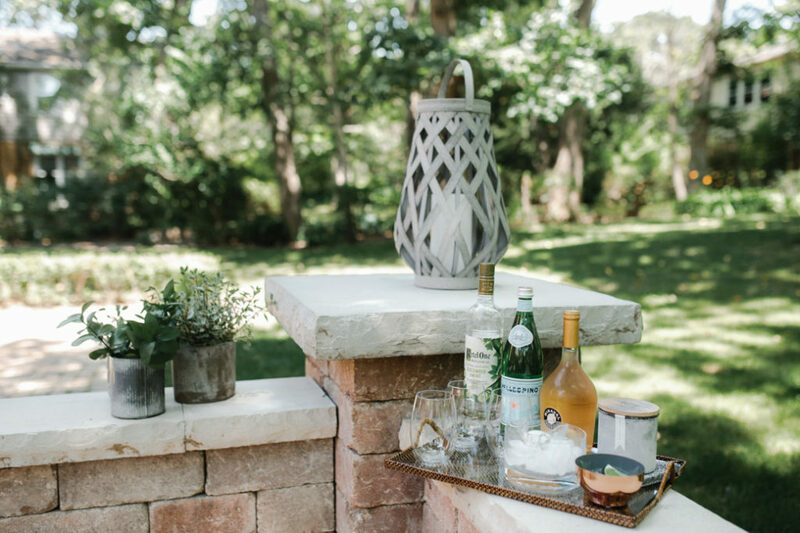 These outdoor lanterns were perfect to sit on top of our pillars. I also recently bought these for our outdoor dining table. Of course there is still further touches that need to be added. 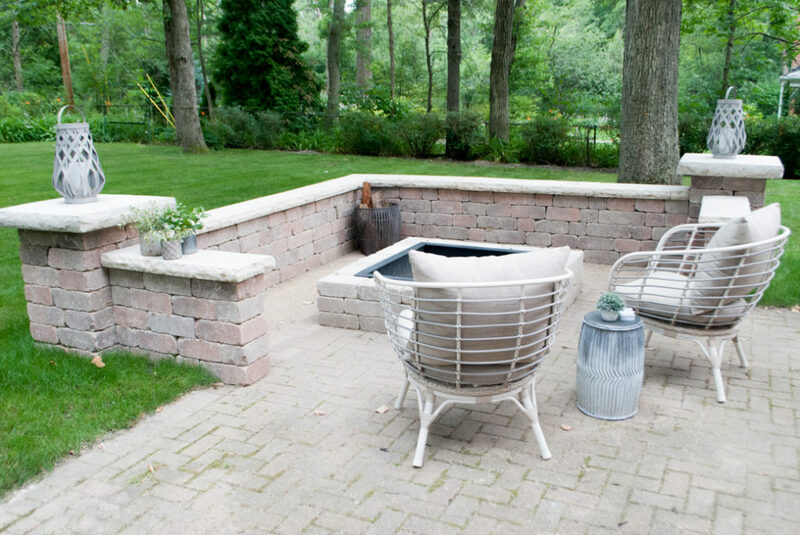 I would like to incorporate outdoor planters in various sizes filled with greens to scatter around this space! Creating this space might be my favorite improvement we have done to our home! Every time I am at my kitchen sink, I get to look outside and see the space my family created. On top of that, we spend many summer evenings together making smores and sitting by the fire. 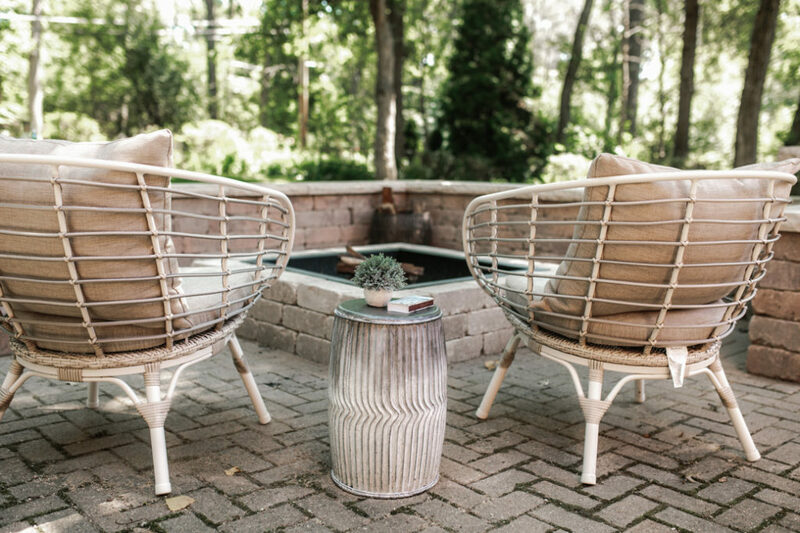 We can easily take this space into fall as well! 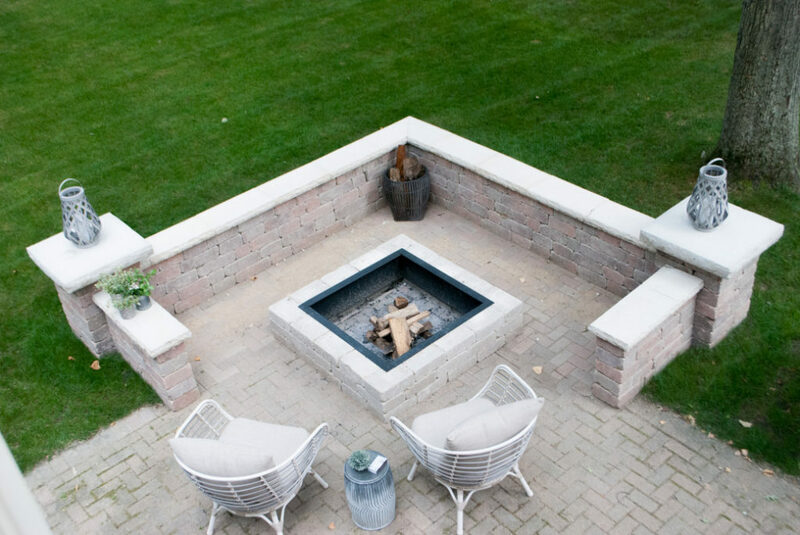 If you would like more detailed info on planning for an outdoor sitting wall and fire pit , please feel free to email me and I will have Rob answer as best as I can!